The summer season is known for the numerous pool parties, barbecues, and get-togethers that are thrown every year, most often in someone’s awesome backyard. 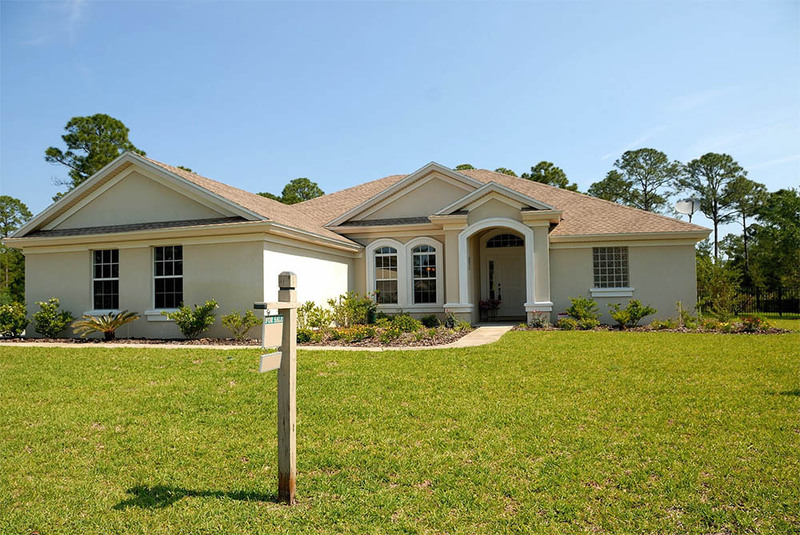 The warm summer nights make this season one of the best times to enjoy the outdoors with friends and family, but without sufficient coverage from the sun’s blazing heat, it would be hard to equally enjoy the hot summer days. While getting a daily dose of Vitamin D is good thing, it’s important to shield yourself from the sun’s damaging rays. The best way to ensure that you and your guests stay cool and comfortable in the sun is by providing a little shade around your yard or patio. 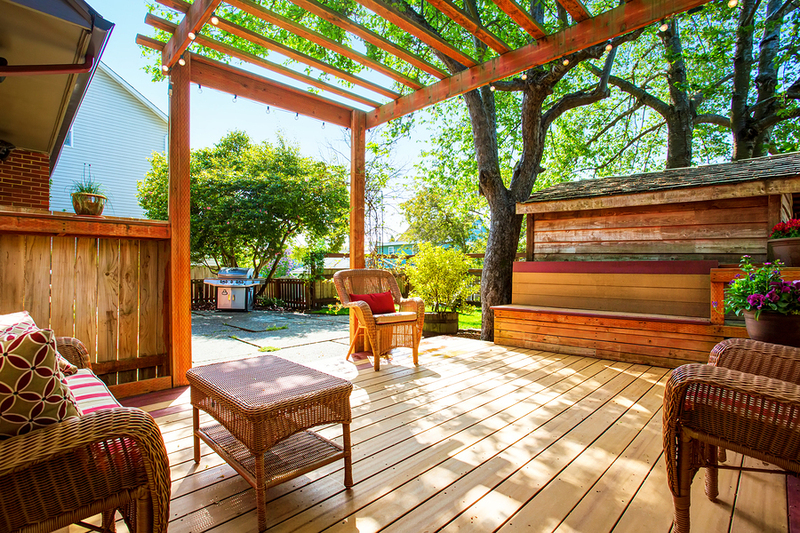 Have no natural shade in your backyard? No problem! There are a variety of ways to create some shade while you’re enjoying time in your outdoor living space with patio umbrellas, shade sails, and more. Some popular and practical ways to create ample shade can be achieved with fabrics. String up some sturdy, outdoor fabric over your designated space to make your own shade sail. Shade sails can be as big or small as you need them to be depending on your space. Canopies and awnings are versatile and inexpensive ways to diffuse the sun’s rays. Shade sails, canopies, and awnings can be found in an array of colors and materials that match your backyard’s color scheme and style to help tie the space together. For a more closed in arrangement, try hanging floor length canvas curtains that you can easily untie, or design a lovely focal shaded area by using Sunbrella® fabric to create your own cabana. For outdoor living spaces with walls and windows, dress window frames with colorful curtains, or opt for bamboo blinds or solar shades. Each of these options are adjustable, making it a breeze to raise or lower them as needed to adapt to the sun’s angle. If you prefer a more natural ways to block the sun, potted trees add a nice touch to any space and can be moved around as needed. Wood structures such as a trellis or pergola also make a beautiful statement and add to the natural ambience while creating nicely shaded areas. Both of these options are designed to support climbing plants like ivy, morning glory and bougainvillea. A pergola, or two, covered in lush greenery can provide a great amount of shade for guests as they enjoy their time in your outdoor entertainment area. One of the most versatile and affordable options to get some shade in your backyard is to opt for a large, classic patio umbrella. 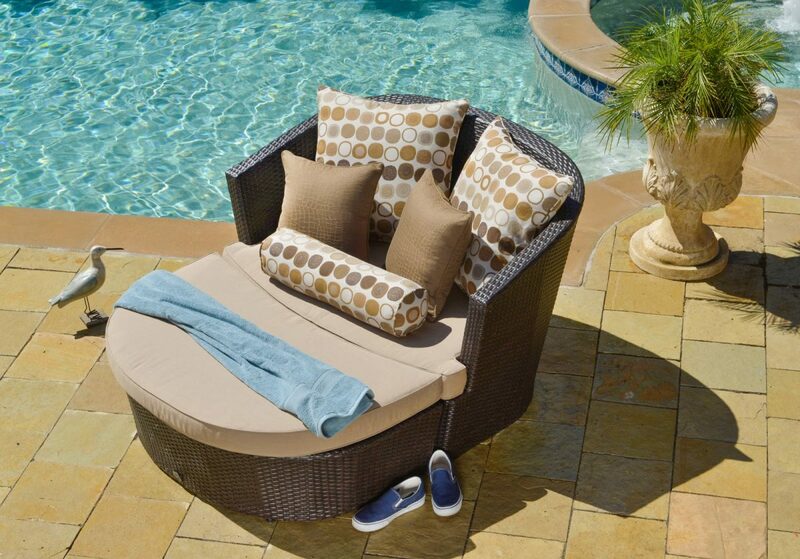 Patio umbrellas offer complete protection from the sun’s UV rays while adding style and functionality to your space. The nice thing about an umbrella is it can also be used to complement many other shade options that were previously mentioned above. In addition to shielding guests from harmful UV rays, patio umbrellas can also shield people from unexpected afternoon rain showers. 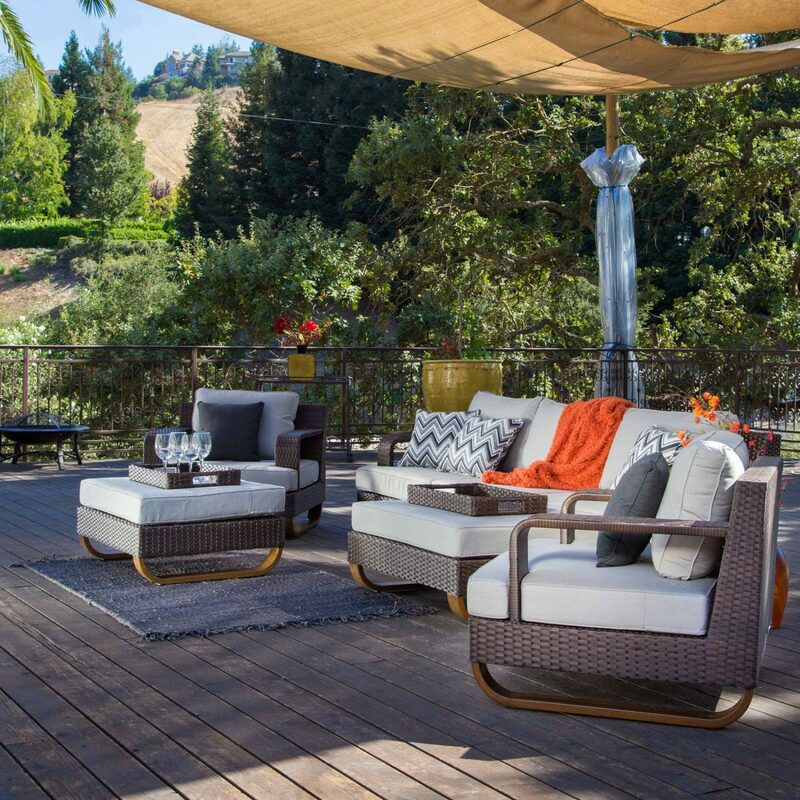 Depending on the size of your outdoor living space, perhaps multiple patio umbrellas will be needed to provide the right amount of shade in different seating areas. Having a patio umbrella covering your outdoor dining collection will make for a more pleasing and relaxing meal. 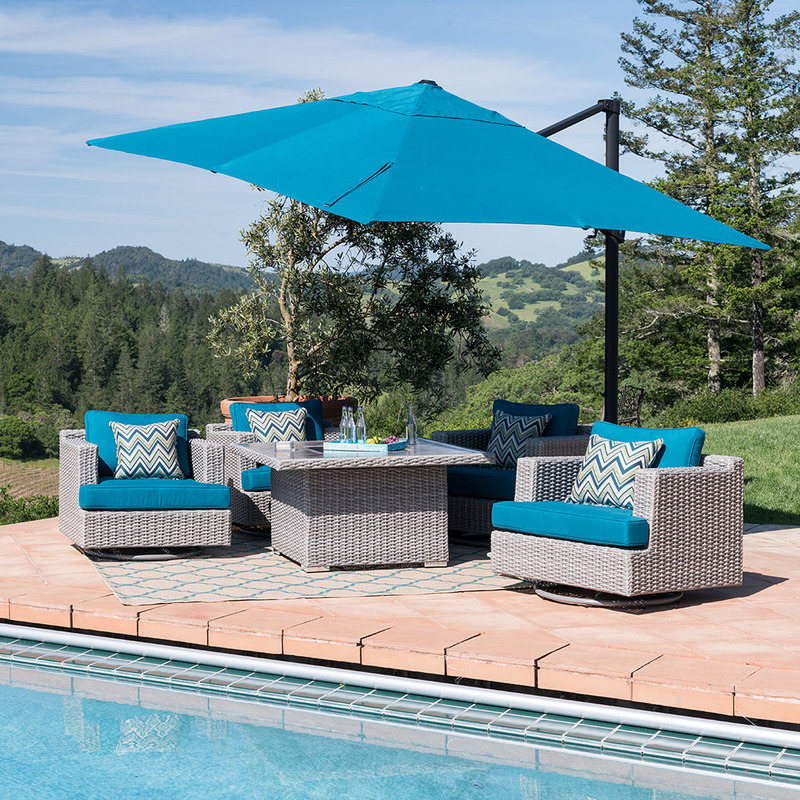 A resort umbrella over your outdoor patio furniture set will create an inviting area to spend time with friends and family on those sunny Sunday afternoons. Perhaps an afternoon nap on your chaise lounge under an umbrella post-sunbathing time with the sounds of shore birds and the light breeze rustling the tree leaves or palm fronds in the background is just what you need. 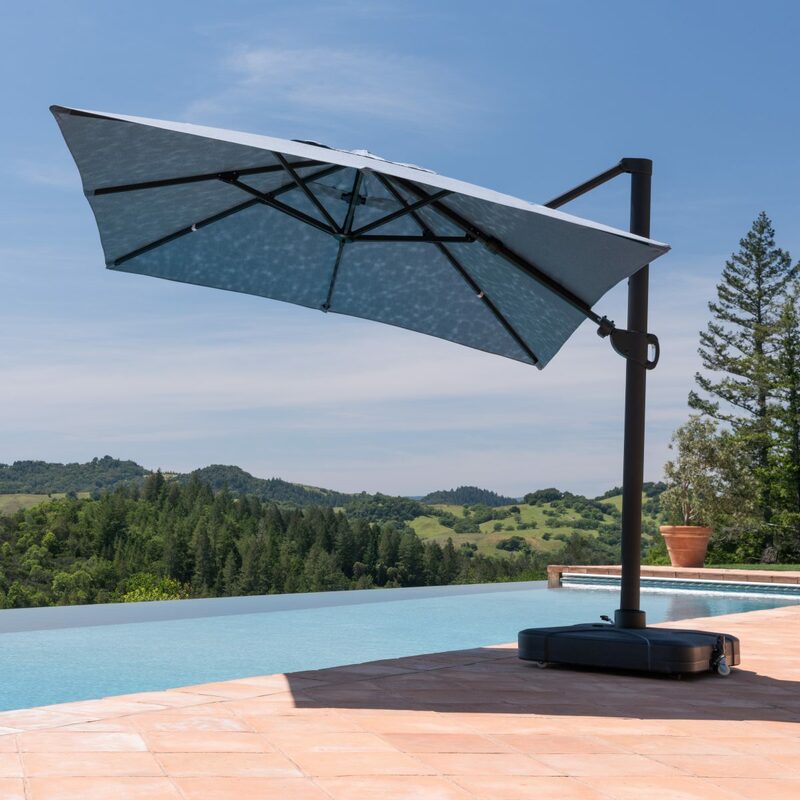 Many of the patio and resort umbrellas on the market today are made of durable materials, easily tilt-able, adjustable, and retractable. If you’re on the look out for a quality patio umbrella, make sure to find one comprised of study materials to ensure proper support, durability, and protection. It’s important to make sure the umbrella comes with a solid base so that it is anchored well on the ground. Some patio umbrella bases also come with wheels for ease of mobility, so you can move your umbrella wherever it is needed in your backyard. Opt for umbrellas that have weather, UV, and mildew resistant fabric, as these canopies will better withstand nature’s wear and tear through the years. Whether you’re looking to dine outdoors with family, spend a peaceful afternoon with nothing but the company of a good summer book, or engage in riveting conversation with friends over brunch on your patio, a shaded outdoor living area is always an ideal spot to enjoy your time together, especially during the warmer months.